Here at Mackay Bar Outfitters & Guest Ranch, our meals rate high among visiting guests. We provide top quality, chef prepared home-cooked meals as part of your memorable vacation. The cuisine we prepare and serve to our valued guests is not your run of the mill fare. We go the extra lengths to select choice cuts of meat, fresh produce and insure that your food experience is every bit as enjoyable as the premium vacation adventures you’ve booked for your magical stay at Mackay Bar Ranch. All meals are served in our Main Lodge, which offers a relaxing, down home feel. Take a peek at our Sample Menus below, modified for the best seasonal selections available. We encourage guests to socialize around the fire after dinner or even sit outside on the patio overlooking the beautiful and historic Salmon River. Fresh Berry Cream Cheese French Toast – top this homemade fluffy French bread with our house made mixed berry sauce and cream cheese spread. Served with divine melted cheddar scrambled eggs, seasonal fruit, sizzling bacon, refreshing orange juice, tea and coffee. Deliciously Simple Pancakes -griddle-made flapjacks like your grandmother used to make them, drizzled with melted better and warm maple syrup. Served with divine melted cheddar scrambled eggs, seasonal fruit, sizzling bacon or ham, refreshing orange juice, tea and coffee. Southern Style Biscuits and Gravy – soft, doughy biscuits accompanied with gravy, naturally flavored by black pepper and sausage. Served with divine melted cheddar scrambled eggs, seasonal fruit, refreshing orange juice, tea and coffee. Crispy Hashbrowns– shredded Idaho potatoes pan fried to crispy perfection. Served with divine melted cheddar scrambled eggs, seasonal fruit, sizzling bacon or ham, refreshing orange juice, tea and coffee. Eggs Benedict – Hot buttered English muffins, Canadian-style bacon, and poached eggs are topped with a heavenly drizzle of hollandaise sauce. Served with fresh fruit. Barbq’d Tri Tip with Horseradish – top quality tri trip drizzled in our house-made marinade with a hint of horseradish served with salad and fresh baked bread hot out of the oven, a seasonal vegetable and twice baked Idaho potatoes mixed with sour cream, shredded cheddar cheese and bacon bits. Impossibly Tender Prime Rib– a boneless roast slow cooked in our smoker to juicy perfection with hints of rosemary served with salad and fresh baked bread hot out of the oven, a seasonal vegetable and twice baked Idaho potatoes mixed with sour cream, shredded cheddar cheese and bacon bits. Camas Prairie Chicken– chef choice prepared chicken with salad, a seasonal vegetable paired with hand-whipped mashed potatoes and gravy and warm cheddar and garlic infused biscuits. Baked Salmon– baked salmon filets drizzled with lemon juice, fresh salad, rice pilaf, steamed seasonal vegetables and cheddar and garlic infused biscuits. Homestead Juicy Pork Loin– moist and tender pork loin wrapped in our homemade stuffing and simple marinade, fresh salad and hand-whipped mashed potatoes with gravy, rosemary roasted carrots and fresh baked bread hot out of the oven. Grilled New York Steak or Rib Eye Steak served with fresh baked bread hot out of the oven, fresh salad, a seasonal vegetable and twice baked Idaho potatoes mixed with sour cream, shredded cheddar cheese and bacon bits. Barbq’d Kabobs – Summer Favorite! – grilled chicken or slow cooked beef kabobs with hand picked seasonal veges added to the stick! 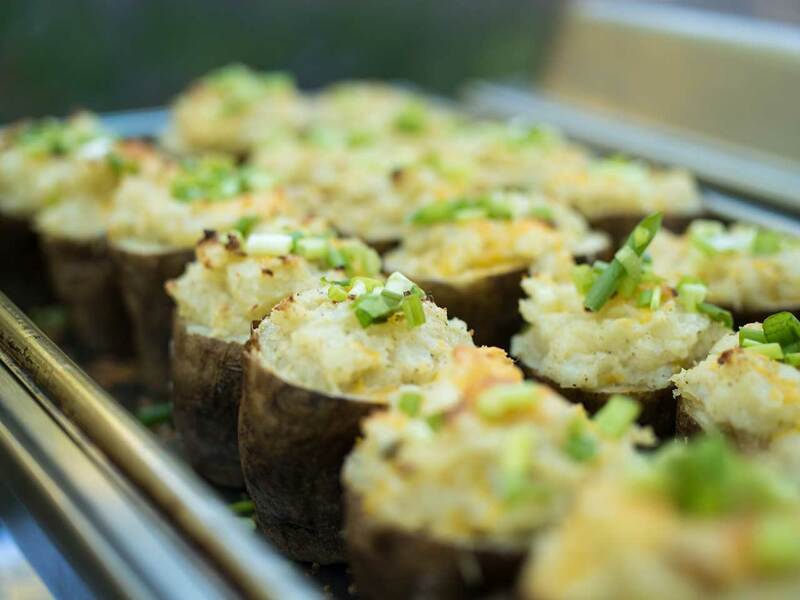 Served with salad and fresh baked bread hot out of the oven, a seasonal vegetable and twice baked Idaho potatoes mixed with sour cream, shredded cheddar cheese and bacon bits. Back River Brownie Sundae– A warm fudgy brownie served with French vanilla ice cream or chocolate sauce. New York Baked Cheesecake– Traditional graham cracker crust and a rich creamy filling drizzled in our seasonal fruit sauce. Mom’s Apple Pie – Fresh pie like your mom used to make. Salmon River Carrot Cake – A fresh take on a classic favorite, melt in your mouth carrot cake.